A confectionery shop in Yorkshire has been officially named as the oldest in the world. The high street store, called the Oldest Sweet Shop, has been selling sweets in the market town of Pateley Bridge since 1827. Former bank manager Keith Tordoff, 58, who bought the business with wife Gloria 20 years ago, said he was overjoyed when Guinness World Records confirmed it was the longest continuously-running sweet shop on the planet. “I used to love the Guinness Book of Records when I was a lad, so to be in it is really exciting,” he said. “It’s not just a business – it’s something I’m absolutely passionate about. “To me, sweets are all about the memories. You remember sweets from your childhood just like you remember a song. You remember the sweets your grandparents gave you, or giving a packet of Lovehearts to a girl you liked. BEST Prices – Buying DIRECT From The Factory! “We had a 97-year-old woman come in to the shop and say the last time she was here she was five years old. She said apart from the position of the counter, it hasn’t changed. Mr Tordoff said the shop is one of the oldest buildings in Pateley Bridge, a small, idyllic market town north of Harrogate, and was used as a store when the surrounding hamlets and villages were being built. In 1827, herbal and spiced sweets were made on site and sold along side chocolates, boiled sweets and toffees. An early photograph of Nidderdale high street dated 1903 shows the shop but it had no signs on the front. However, invoices from the time refer to it as the Old Sweet Shop, a name which evolved into the Oldest Sweet Shop in the mid 20th century. Past research had suggested it was the world’s oldest but the record was not officially validated until this year. Inside, it has been virtually unchanged for 100 years, with large glass jars on dark wood shelves and the original till, which Mr Tordoff recognised in an antique shop and rescued. It specialises in traditional sweets and best-sellers include salty liquorice, bon-bons and Yorkshire Mixture – assorted boiled sweets. “From being a young lad I’ve always been fascinated with sweet shops,” added Mr Tordoff, whose favourite retro sweets treat is the retro foamy sweet Milk Teeth. “I’ve always had a sweet tooth. “I used to come into the shop and say to the elderly lady called Janet who was running it ‘if you ever sell this place, I want to buy it’. A Guinness World Records spokesman said the longest continuously-running sweet shop is an entirely new record entry and was validated in January. It is listed in the Guinness Book of Records, which went on sale yesterday. Fantastic Prices – Buy DIRECT From The Factory! 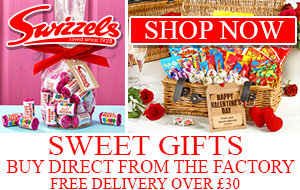 Swizzels Make Love Hearts, Refreshers, Double Dips, Parma Violets, Rainbow Drops and Drumsticks!